Original color lithographic poster, printed by Max-Courteau Imp., Paris, France 1934. Condition: Near Mint (A) , backed on linen. 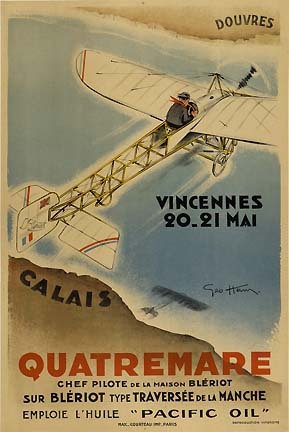 Sheet size: 23 H. X 15.25 W.
This 1934 poster by Geo Ham features the Berliot XI monoplane piloted by Charles Quatremare replicating the first flight an airplane made over water. The flight is a part of the 6eme Fete de Aviation held in the Paris airfield at Vincennes. Quatremare was the chief pilot of Bleriot Aeronautique, the Boeing of its time, and he was also responsible for pilot training. He performed as an acrobatic pilot participating in rallies and meets throughout the Paris region. Quatremare commemorates the 25th anniversary of Louis Bleriot's1909 crossing the English Channel from Calais, France to Dover, England in the plane now dubbed the "Traversee de la Manche". The 22 mile journey took a total of 36 minutes and 30 seconds. During the flight, Bleriot encountered rain, turbulence and poor visibility but was able to stay the course without the aid of a compass or modern instrumentation. This flight was just the beginning of Bleriot's leading role in the development of aircraft that could go faster, farther and higher. This poster provides an interesting glimpse into aviation history and our continued fascination with flight.